Energy-efficient window coverings help keep your home warmer in the winter and cooler in the summer. Over 30 years ago, Hunter Douglas® Window Fashions introduced the original honeycomb shade—a breakthrough in energy efficiency. Since then, Duette® honeycomb shades (also called cellular shades) have evolved to provide an even higher level of unparalleled energy efficiency paired with enduring style that will grace homes for years to come. 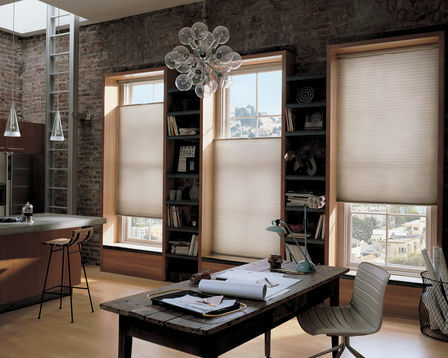 Duette® honeycomb shades provide smart and stylish solutions that are just as beautiful as they are beneficial. Available in hundreds of fabrics, textures, and colors inspired by the latest fashion trends, their innovative operating systems and wide range of light-control options bring stunning practicality to every room in the home. And, with the patented TruePleat™ construction, shades remain crisp and consistent from front to back, and top to bottom. Enjoy the convenience of our battery operated or hard-wired control systems doing the work of raising, lowering, traversing or tilting your honeycomb shades for you. Providing the ultimate in window treatment control, our motorized systems allow you to operate your shades individually or in groups, by remote or programming. Simple and cord free, our motorization options are aesthetically pleasing and safer for children and pets.